View basket “Organic Anise Toothpaste” has been added to your basket. This mouthwash aims to reduce tooth erosion and protects the oral cavity. 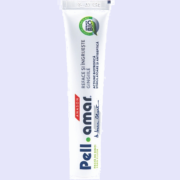 It also works strengthen the tooth enamel as well as providing fresh breath. PELL AMAR EXTRACT –works to heal and maintain healthy gums with its anti-inflammatory components. CHAMOMILE EXTRACT –emollient, emollient, anti-inflammatory, deodorizing, antiseptic, slightly anaesthetic action. ECHINACEA EXTRACT – effective in treating lesions that take a long time to heal, herpetic lesions, local infections, cicatrizant and antiseptic, while also stimulating natural immunity. Formula is fluoride-free as this reduces the risk of damage due to fluoride excess. It is recommended to use this product twice a day, in the morning and evening. To get the appropriate quantity press the bottle to fill the dosing cap. AQUA, GLYCEROL, CHAMOMILLA RECUTITA EXTRACT, ECHINACEA PALIDA EXTRACT, MENTHA PIPERITA EXTRACT, ETHYL ALCOHOL, SODIUM LAURYL SULFATE, PELL AMAR EXTRACT, SODIUM SACCHARIN, PEG 400, DISODIUM PHOSPHATE. An ideal product for mouth hygiene. 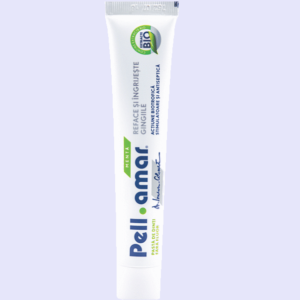 Mouthwash PellAmar feels very fresh and leaves you the feeling for a long time. It’s a great product, I recommend it with confidence!